How does something which only lasted two months come to symbolize the popular concept of a fad? Simple – it exceeds all appreciable levels of ridiculousness! Such was the case with goldfish swallowing. 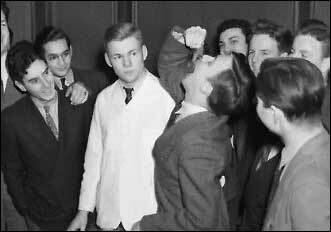 Goldfish swallowing started as a fad in the spring of 1939 when Harvard freshman Lothrop Withington swallowed one when a classmate wagered that he wouldn’t. Withington had seen it done 10 years earlier while on vacation and bragged that he had done it once before. The event received vast coverage from the local media in Boston and soon college students throughout the country were trying to top his feat. Within weeks, students (mostly men) were sucking down five, ten, twenty and even thirty fish at a sitting. At some point, adults began feeling that the fun-natured frolicking of college students was not really all that funny. Many towns passed ordinances making it illegal and a Massachusetts State Senator presented a bill which attempted to protect the fish from “cruel and wanton consumption.” Universities threatened to suspend or expel participants for “conduct unbecoming a student” and the U.S. Public Health service warned that ingesting live goldfish could result in the swallower contracting anemia through tapeworms living in the fish. Finally a professor at U.C.L.A. concluded that an adult male could safely consume up to 150 fish, but warned against exceeding that amount.